I literally shot this blind because I had to focus on driving but my camera was around my neck so I took a shot without looking to see what I was getting. spectacular! happy you didn't worry about aiming the camera because that would be so dangerous. my husband does the same thing. great result by the way. have a great weekend. Oh, Wow! You captured a spectacular slice of your scenic drive.. a split second that I could almost taste. Love it! Whoa! That is a big blue beautiful sky! WOW!! What a gorgeous, huge blue sky indeed!! Terrific capture, Carver!! I love it!! you did good. i must admit to clicking when I'm driving too. It was an amazing shot. Carver, I love this big blue sky. Gorgeous capture! Have a great weekend and happy skywatching! Your blind shot is stunning, Carver. Aha ... and I thought I was the only one who did this. 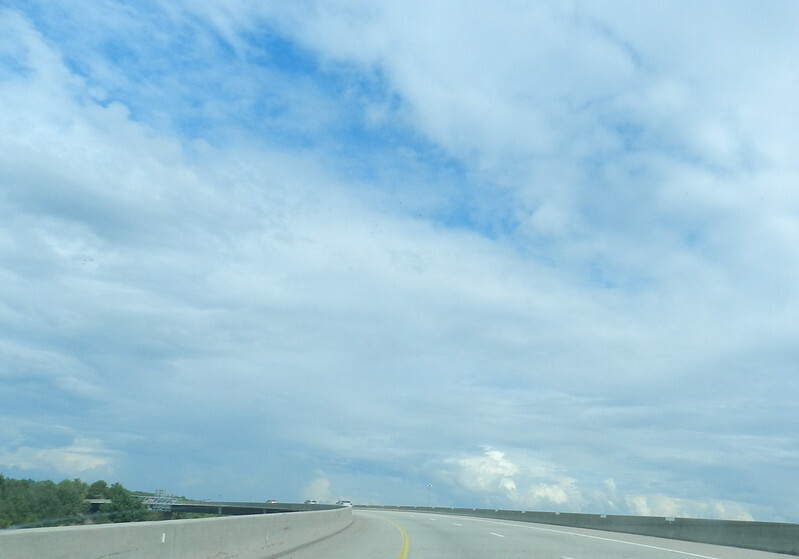 I love sky shots with the road ahead included. It's particularly poignant at sunset. Wonderful photos as usual, Carver. Happy weekend.